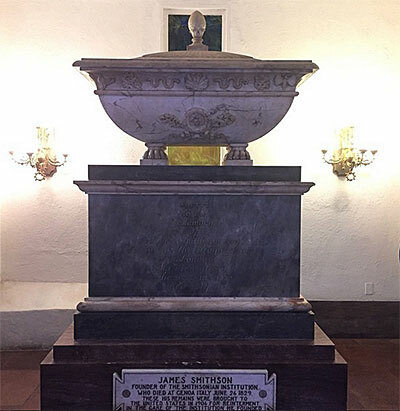 The final resting place of the Institution's benefactor, James Smithson (1765-1829), is a small chapel-like room located at the north entrance to the Castle. An exhibit cases contain a few of Smithson's personal effects. A panel explains how Smithson's remains came to the United States in 1904 and the Smithsonian's plans to build a memorial to him.